The latest beast bowl addition is another fantastic way to get your proteins and all your veggies in one meal. Eating a steady stream of protein balanced with veggies and enough carbs is the best way to keep your hormones and metabolism balanced. Imagine the best chicken burrito you’ve ever had, then just put it in a bowl. You can pick whatever combination of veggies from the list of bowl ingredients that you like – start with those as your base. The amounts provided are a rough estimate, but you can always add more or less depending on your taste. I’m working on a long list of Beast Bowls to come. I hope you will stay tuned for them all. I ‘ve found that most often on the days where I am busy and running around with way too much to do I often throw together some arrangement of veggies and protein in a bowl and then add some sort of flavor bomb sauce and call it a day. I am working on putting these together so that you took an have all the stuff on hand to make quick and easy meals all week long. I know you will love this Chipotle Chicken Beast Bowl as much as I do. If you make it, I wanna see it #foodologygeekbeastbowl insta and share it with me. 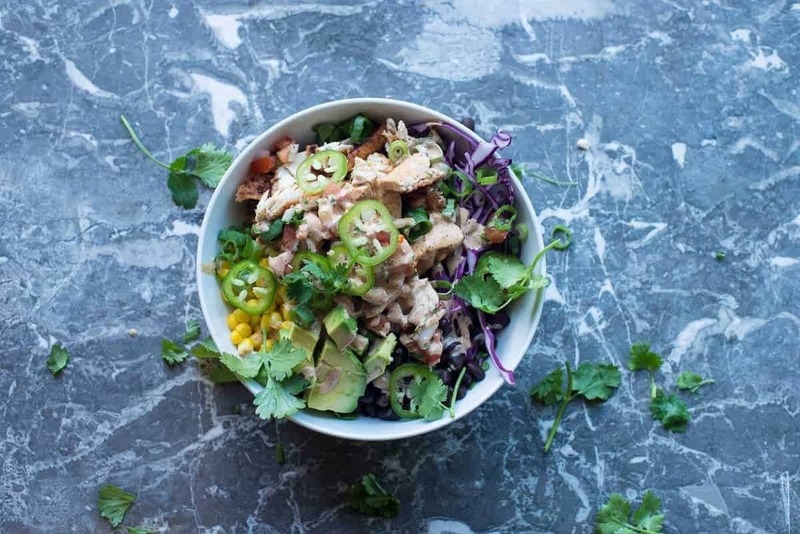 Chipotle Chicken Beast Bowls with Chipotle Lime Dressing. So many veggies and a healthy serving of protein. Another addition to the line-up! Toss chicken breasts with salt, pepper, taco seasoning and olive oil. Let rest for 5-10 minutes, chop. Assemble your choice of ingredients in a sizable bowl. Add dressing and jalapeños. Top with avocado.